My husband does. He would rather sit down with a slice of brie and some crackers than eat any other snack. 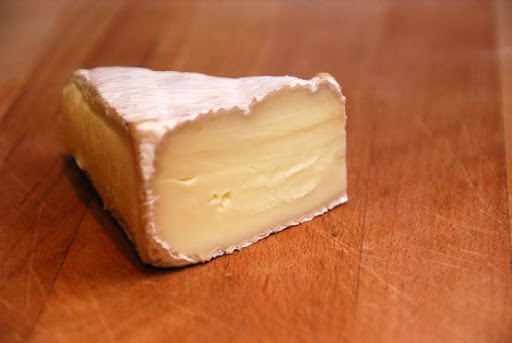 So, when I brought home this hunk of brie, but told him he couldn't touch it because I had plans for it, he sulked. And, then I made him these. And, he planted a smooch on me that I'll never forget. Eight years in and he still loves my cooking and I'm still a bowl of jelly in his arms. We're a good match - he and I. He's my "fahm boy". I'm his "Buttercup". He's my Han. I'm his Leia. He's my Fred. I'm his Daphne. Weren't we just talking about brie and taters? What's going on here? My apologies. 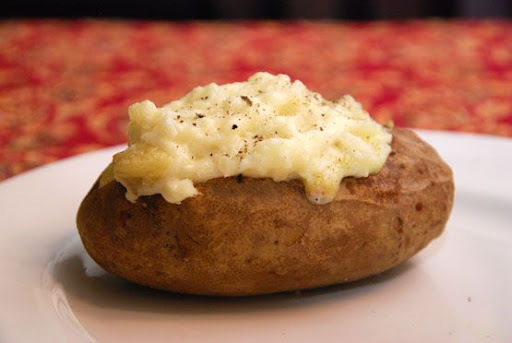 Wanna make some brie-stuffed potatoes with me? I baked four large potatoes at 400 degrees for one hour. Then, I cut oval shaped slits in the tops of them. And, removed the part I cut out. Using my mini cookie scoop, I scooped out most of the potato into a bowl. 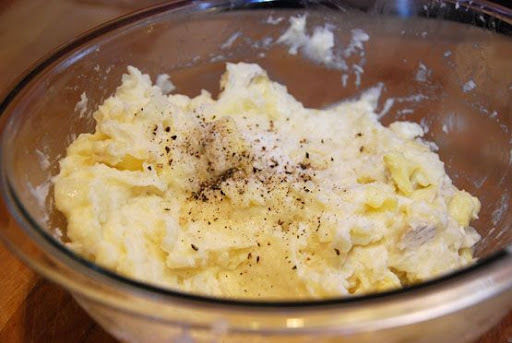 I added butter and cream to the potatoes and beat them with my mixer. (You could use half-and-half or milk if you want to make a lower fat version.) Me? Heavy cream, baby! I added it to the potatoes. 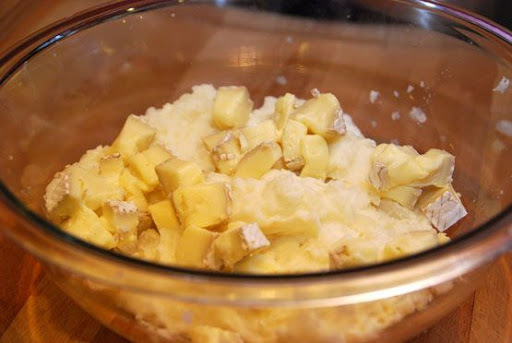 Along with some salt and freshly ground black pepper, and gently folded the brie into the creamy potatoes. Using my mini-scoop, I added the brie and potato mixture back into the potato skins. And, baked them for 15 minutes at 350 degrees. I served them with steak. 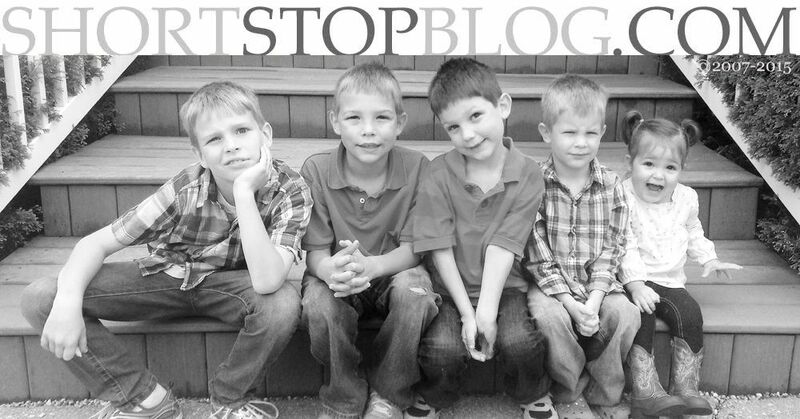 They were so good - such a nice change-up from traditional twice baked potatoes. And, they brought on a kiss for the ages from my brie-loving sweetheart. I'll be making them weekly. Preheat oven to 400 degrees. 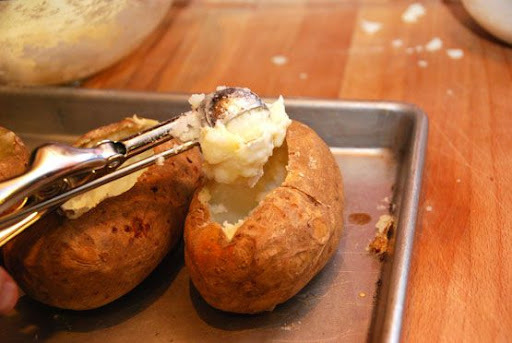 Prick potatoes with a fork and bake for 1 hour. Remove from oven and reduce heat to 350 degrees. 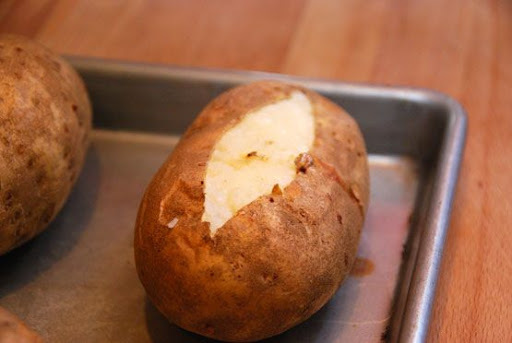 Allow potatoes to cool for 10 minutes so you can work with them. 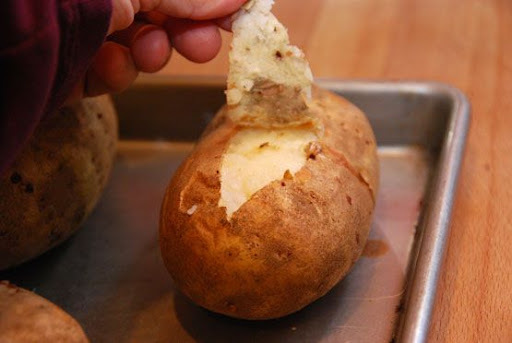 Cut an oval shaped slit in the tops of each potato. 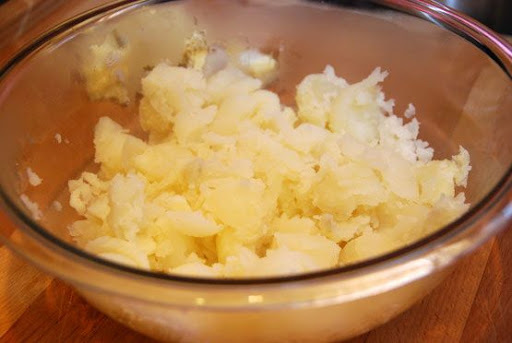 Using a mini scoop or spoon, remove the pulp and place in mixing bowl, being careful to keep skins intact. 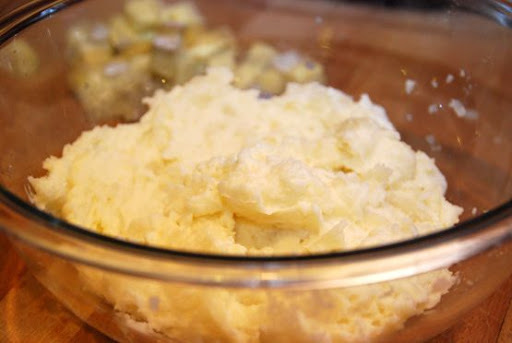 Add butter and cream and beat until combined, but leaving potatoes still a bit chunky. 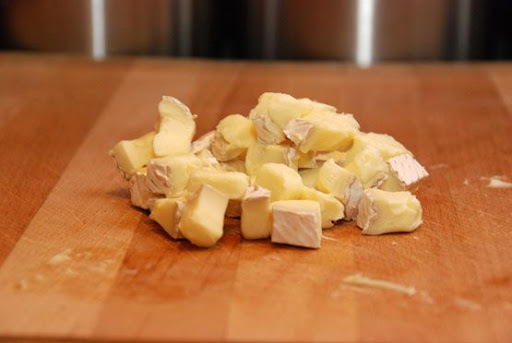 Gently fold in chunks of brie, salt, and pepper, being sure to leave brie in chunks. 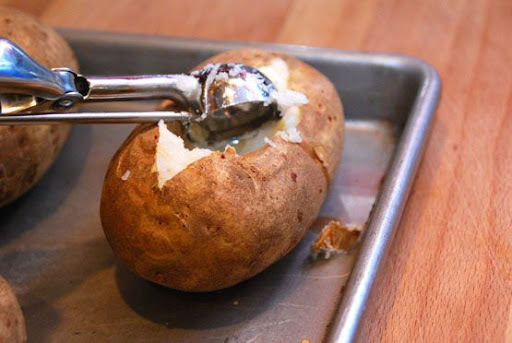 Using 2 spoons or a mini scoop, place potato mixture back into potato skins. Bake at 350 degrees for 15 minutes. Serve immediately. *You can add your favorite herb to these potatoes - thyme, rosemary, or dill would be great. I liked the simplicity of them for the meal I was serving, but jazz these up to your liking! Sarah, Sarah... You are so darn hilarious. I love the way you tangented off into husband-smitland for a while...You two are made for each other. Your ooey gooey brie-love. And these, my friend, look amazing. Simply amazing. Mmmm... 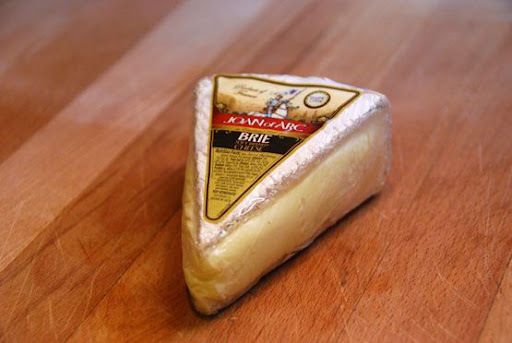 I LOVE brie! And you can get a whole wheel of it for like $6 at Costco. I enjoy mine with some apricot jam on a Wheat Thin, but this looks yummy! YES! 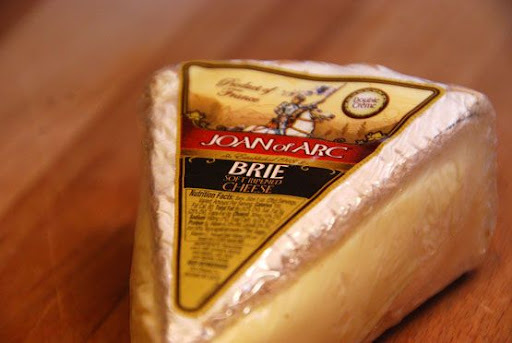 I love Brie too - must run in the family :) Don't expect a kiss like that but i will certainly show some love for posting this recipe...sounds so delish! I am a complete meat and potato kind of girl. Nothing makes my tummy more happy than a steak and a yummy baked potato... my fav date night is when we grill steaks after the kids go to bed and sit at the table wit hour meat and taters and chat. I'll be getting me to the store for some steak, tater, and brie ASAP.